Juventa & Answer42, Mike Koglin vs. 7 Skies, Tritonal feat. Cristina Soto, Ashley Wallbridge feat. Audrey Gallagher, Ronski Speed & Stine Grove and more. 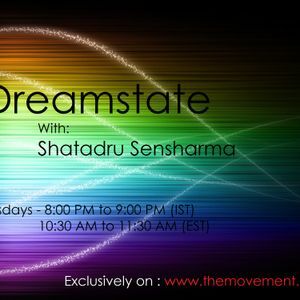 Dreamstate is an hour long weekly radio show dedicated to soulful trance music and aims at uniting all trance lovers across the world. The show is mixed by Shatadru Sensharma (17 years old) who is from Pune, India and airs every Tuesday 8PM to 9PM (IST) on The Movement FM. The show will feature some of the best Trance music out there including some classics and the latest releases. Shatadru will also host guests occasionally on the show. If you are a trance lover, be sure to tune in every Tuesday! Get lost in this mystical genre of EDM, go into a “Dreamstate”!